It is the perfect ballpark for Nashville, a city where the modern prevails — but always with a nod to the past. First Tennessee Park, the new home of the Nashville Sounds (Class AAA; Pacific Coast League), is a triumphant return of pro baseball to Sulphur Dell. Today’s Nashville is a boom town, fueled by modern industries like finance, health care, higher ed and media/music production. Today’s Nashville skyline reflects that diverse modern economy, and the hot development environment just keep growing hotter and hotter. That Nashville skyline is beautifully framed by First Tennessee Park, located just north of downtown and the state-government complex. Right now First Tennessee Park is a work in progress — or, rather, the development pieces surrounding the ballpark are still under construction, even though the ballpark is basically done save some entrances and a greenway to be built on the south side of the ballpark. When all the work is completed sometime next year, First Tennessee Park will be surrounded by apartments, parking ramps and restaurants. Work on two of these projects has started; the rest will start this summer. Now, First Tennessee Park is certainly a modern ballpark; the grandstand lines are clean and the materials are state of the art, ranging from the tactile exterior on the north side of the ballpark to the acrylic floor covering in the grandstand. Some of the finishes choices were pragmatic — the grandstand floor covering also helps in case of flooding (something that will undoubtedly happen in coming years; the ballpark was designed to withstand a 100-year flood of the nearby Cumberland River) — but others were just lovely. Take the aforementioned exterior tiles: they’re a unique ballpark finish, and they also sparkle at night. The effect should even more dramatic once the apartments on the south side of the ballpark are completed. Another nod to the modern: the ballpark was designed for LEED Silver certification with a green roof, rainwater harvesting and a rain garden. There is one direct homage to Greer Stadium, the team’s previous home: a guitar scoreboard. 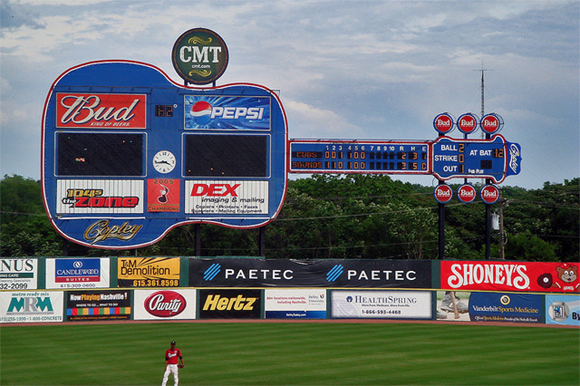 What many people remember most about Greer Stadium is the guitar scoreboard in left field (shown below), and that ballpark element is present at First Tennessee Park’s right-field guitar scoreboard, The scoreboard features an HD LED screen measuring 4,200 square feet, making it one of the largest in minor–league baseball. The scoreboard illuminates one of the most popular spots in the new ballpark: the Band Box bar, located on the right-field concourse. A band box, of course, describes a small, intimate ballpark — Sulphur Dell was certainly a band box of a ballpark. And, of course, with Nashville being Music City, anything referencing music will play well. Add Strategic Hospitality as a partner — which runs local establishments like Paradise Park, Aerial, Merchants Restaurant, The Patterson House, The Catbird Seat, and Pinewood Social — and you have a pretty good formula for success. The bar was full of millennials seeking companionship on opening night (as shown below), and you can expect that area will be even more popular as word gets out. An accompanying concessions should open in May, but for now it’s safe to say one of Nashville’s new millennial gathering spots is First Tennessee Park. Though the ballpark’s capacity is 10,000, the opening night sell-out crowd didn’t fell feel overwhelmingly oppressive: the ballpark is designed to disburse folks throughout the entire site, which measures some 10.8 acres. (It also helped that Senior Vice President – Operations Doug Scopel and crew ran a pretty smooth game-day operation.) The wide 360-degree concourse– ranging in width from 24 feet to 35 feet — had the feel of an MLB ballpark concourse, as the six permanent concession stands and the supporting facilities (serving beer, Icees, funnel cakes and more) generated lines, but not concourse-clogging lines. You could see most of the action from the open concourses, but there were plenty of TVs for those with blocked views. Field-level suites are located directly behind home plate, and they’re the best seats in the house. They’re unusual — you can find them in Coca-Cola Park, home of the Lehigh Valley IronPigs, and BB&T Ballpark, home of the Charlotte Knights (both Class AAA; International League) — and it’s almost like being on the playing field. They’re spacious: they feature 33 exterior seats and interior lounge space to accommodate an additional 22 fans. The 5,080-square-foot club level features a formal bar, concession stands, indoor seating and an outdoor patio on the second level of the ballpark. This space was also designed to be used throughout the year. Club patio decks are located on each end of the second level, and they’re dedicated to groups. Both feature great views of the ballpark as well as downtown Nashville skyline. The &Vodka 4-top seating area features half-moon four tops, which are becoming quite the popular offering in pro baseball. This section is in the right-field corner. The Vanderbilt Children’s Picnic Place (shown below) can accommodate up to 200 fans and multiple groups with all you can eat. The left-field Hyundai Deck can accommodate up to 600 fans and multiple groups with all-you-can-eat ballpark fare. The Twice Daily Grass Berm was crammed with families, who brought in plenty of blankets and plenty of kids. The baseball gods certainly displayed an impish sense of humor with the opening-day matchup between the Sounds and the Colorado Springs Sky Sox: the Milwaukee Brewers were formerly the Sounds’ parent and are now parent to the Sky Sox. The Oakland A’s signed a new affiliation deal with the Sounds this offseason, and we’re guessing they’re pretty pleased with the facilities at First Tennessee Park — the stuff that fans don’t see but players and minor-league coordinators treasure. The indoor batting cages are large, spacious and air-conditioned; the clubhouses are roomy; the lockers are wooden and attractive; the dugouts are huge; the workout room is well-equipped. All the needs for players — ranging from nutrition to conditioning to the training room — are met at First Tennessee Park, complete with cleat-proof carpet. That attention to detail can be found in plenty of other places in the ballpark. Take, for example, the aforementioned field-level suites, where the first row of seats are below grade. That area of the ballpark was designed to withstand potential flooding; remember, the ballpark is in a flood plain, and it was designed to withstand a 100-year flood. If that happens, the field-level suites will certainly flood, so they were designed with detachable floor boards and movable food-service tables, complete with casters. The floor outlets and electrical switches are located higher to prevent water damage. All in all, First Tennessee Park is already a winner: it’s a modern ballpark that fits perfectly into today’s Nashville ethos. It’s already generated development in a formerly run-down part of town and should spur even more development once the money folks see what’s happening north of downtown. It will be exciting to see First Tennessee Park once the construction dust settles and everything is functional — but for now, it’s already become one of the top ballparks in Minor League Baseball. Come hungry. Nashville is a great food town these days, and the offerings at First Tennessee Park reflect that. There are four main concession stands. Hunt Brothers pizza and wings are served at the Sulphur Dell Slices stand. We headed right to the Hot or Not Chicken for some of Nashville’s greatest contribution to the food world: Hot chicken, in this case from Pepperfire. If hot chicken is too much for you, The Smokehouse BBQ offers smoked pork and chicken legs, as well as garlic fries. Craft beer in the form of Yazoo, Sierra Nevada and Dale’s Pale Ale ($8), as well as macrobrewes from Bud, can be found at three dedicated beer stands. Kids will want to head to the left-field corner for funnel cakes, batting helmets filled with popcorn, snow cones, cotton candy and Dippin Dots. If you visit this season, you’ll need to put up with some parking inconveniences and will probably catch a shuttle to the ballpark. There are multiple apartment and condo buildings and parking ramps set for construction, so by 2016 you’ll be able to park next to the ballpark with ease. Until then, be prepared to head early to the ballpark and grab a parking spot where you can. The Sounds have published a map and parking guide on the team website; check it out before heading to the ballpark. Opening: April 17, 2015. Nashville 3, Colorado Springs 2.